(Nanowerk Spotlight) Modern nanotechnology researchers not only borrow extensively from nature to develop new materials and fabrication techniques, they also manage to transfer proven, and sometimes ancient, technologies into their nanotechnology laboratories. We've written about this before in our stories about welding ("Bronze Age technique works just fine in the nanotechnology era") and metal forging ("From Bronze Age shack to nanotechnology lab - metal forging techniques reach the bottom"). Today, our story deals with yet another ur-technology: spinning. Spinning is the process of creating yarn (or thread, rope, cable) from various raw fiber materials. The first spinning wheel was invented in India probably some 2,500-3,000 years ago, although some claim that the Chinese used similar devices as long as almost 5,000 years ago to spin silk threads. While spinning is one of the core technology foundations of our civilization, researchers have now begun to apply cotton-spinning techniques to fabricate carbon nanotube (CNT) "yarn." "Carbon nanotubes are much stronger than any existing material" Dr. Yuntian Zhu explains to Nanowerk. "To fully utilize their extremely high strength, carbon-nanotubes must be spun into continuous fibers. The most efficient way to produce commercial-scale CNT fibers is by the five-thousand-years-old cotton-based spinning technology. Therefore, it is technologically attractive to produce CNT materials that have spinning properties similar to cotton." Zhu, who was a researcher at the Department of Energy's Los Alamos National Laboratory (LANL) when he published this work (he has since joined the North Carolina State University faculty where he now is an Associate Professor in the Department of Materials Science & Engineering) and his collaborators report a new form of CNT material, CNT cotton, that is made of ultralong individual CNTs. "This CNT cotton is analogous to conventional cotton in many aspects including the color and fluffiness, and is found favorable for spinning" says Zhu. "We found that the CNT cotton is hydrophobic, and is composed of low spatial density and ultra-long individual CNTs. The invention of the LANL researchers has applicability to all applications (structural, electronic, biological) where individual CNTs need to be consolidated into fibers/threads. By using a chemical vapor deposition (CVD) approach, individual CNTs with a length ranging from millimeters to centimeters have been synthesized. This work, which has been published in Advanced Materials ("Carbon-Nanotube Cotton for Large-Scale Fibers") shows that many types of carbon nanotube structures might be synthesized, under various conditions. It will allow scientists to explore more diverse structures made of carbon for new applications. "Large diameter CNTs reported previously were believed to have grown via self-catalytic growth, i.e., CNTs themselves adsorb free carbon species at their open edges and sidewalls and thus grow axially and radially in the absence of metal particles" says Zhu. "However, we believe that our CNT cotton was grown via the traditional catalytic growth mechanism. In particular, our steady CVD environment and extreme long length of CNTs in CNT cotton grown over a long duration corroborate such a mechanism. It is hard to imagine that CNTs can be self-grown with uniform diameter for such a long length over such a long time (1 hour) without the assistance of metal catalyst." After synthesizing the CNT cotton, the researchers spun it into fibers using a spinning set-up built in-house. A speed-adjustable drill equipped with a 25 µm metal tip was used to spin continuous fibers out of the CNT cotton. Zhu describes how the tip was first coated with a layer of glue for initial attachment to a CNT sliver, which was pulled from the CNT cotton. Then the drill was pulled away from CNT cotton at a speed of 10 millimeters per minute while the drill was rotating at 1000?2000 rpm. "Individual CNTs in the cotton were easily collected during fiber spinning, with alignment along the pulling direction" says Zhu. "We can routinely spin 10 cm long fibers from the CNT cotton." 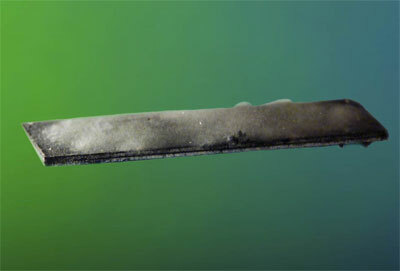 While other forms of CNT materials that have been synthesized so far have various limitations for fiber spinning, the CNT cotton developed by the LANL team is the easiest form of CNT materials for fiber spinning, and importantly, has the potential to adapt for commercial cotton spinning technologies for large-scale production of nanotube-based fibers.